London; the capital of England and a city bursting with activity and iconic sites anyone in the world would recognise in the blink of an eye. We mean, who wouldn’t know that Big Ben, the Olympic Stadium, the Houses of Parliament or Buckingham Palace, were all significant London attractions? Anyway, as the UK’s largest and most populated city, it is no wonder London is the best place in the country to bag yourself your ideal partner and with this in mind, what better way to do it than through speed dating in the city? Ever since its launch, speed dating in the city of London has always been popular but in recent years its popularity has sky rocketed, with London remaining the number one speed dating city in the UK today. Of course, population numbers has something to do with this fact but let’s not forget just how ridiculously fast and active London really is as a city! The people living, working and socialising in the capital lead extremely busy lifestyles and boast hectic workloads but unfortunately do not have much time for socialising or finding love, until now. What is the history of Speed Dating in the city? As you may well already know, speed dating in London is extremely popular and as such, there are plenty of companies in the city offering a full range of speed dating options to the singletons of the capital. From Speed Dater to Slow Dating and from Original Dating to Capital Speed Dating, there is lots of choice available if you want it but here at Dateinadash we are confident we are the freshest speed dating company in the city (and to prove it, our happy speed daters agree!). This is because our impressive range of speed dating events are always fun, innovative and bang on trend in the world of dating in the capital, meaning singles in the city receive the very best dating experiences London has to offer, each and every month. Plus, with an excellent wine tasting ice breaker on offer during the evening, single speed daters can enjoy the chance to sample three different wines from around the world, starting with a light hearted introduction to the art of wine tasting and then moving onto the wine tasting itself where the fun really begins! What types of people go to Speed Dating in the city events? Our highly targeted marketing ensures our speed dating in the city events attract a fantastic mix of highly successful professionals, typically between the ages of 36 and 55 years of age. Drawing in speed daters from across the city from backgrounds in IT, finance, marketing and retail for example, Dateinadash’s city speed dating events appeal to all types of city workers and those living and socialising in the capital, London. And, with approximately 50 singles in attendance you really do have a great chance of finding your ideal match. But if you don’t, do not panic; here at Dateinadash, if you fail to receive any matches at our speed dating in the city event, you can come along to any of our other dating events absolutely free! This is because our 100% Match Guarantee ensures that every speed dater has the chance of finding their perfect partner at one of our many speed dating events held across the UK. Why is Speed Dating in the city of London popular? Speed dating in the city is increasingly popular due to the fact this method of meeting single people actually works! Such methods are designed for single, busy professionals who are bored and tired of other traditional dating methods available in London which clearly haven’t worked for them in the past. Plus, speed dating appeals to pretty much everyone looking for love as you get the opportunity to meet, greet, chat and flirt (optional, obviously!) with lots of other gorgeous singles from the capital who value their time just as much as you! When does Speed Dating in the city take place? For those looking for love and a bit of romance in the capital, our speed dating in the city events take place once a month, on a Wednesday, at All Bar One in Houndsditch, starting at 7.30pm and running until 10.00pm. The stylish and chic city bar, All Bar One, has lots to offer the single speed daters who attend our speed dating in the city events including plenty of sophisticated areas to relax and unwind with beautiful women and handsome men over drinks- the perfect atmosphere for lots of conversation flowing the whole night through. 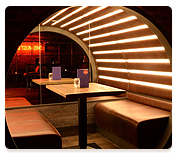 And with fantastic transport links between Aldgate, St Mary Axe and Liverpool Street, All Bar One is easily accessible to all meaning there really is no excuse not to come to one of our speed dating in the city events! So, what are you waiting for? Pick up the phone and call 0845 862 1448 to purchase a ticket to one of our upcoming dating events in London for guaranteed a fun and friendly evening, every time.